There is a great deal of truth to the notion that “laughter is the best medicine”. What is unfortunate in this day and age is that smiling and laughter oftentimes take a back burner to strife and discouragement. Well, we are going to try and change that – even if it is momentarily. If this article can put a smile on your face, then this writer has done his job. 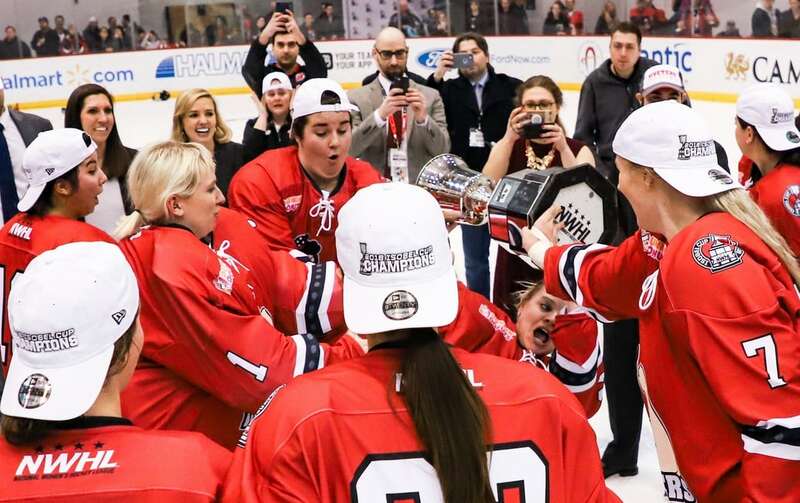 Metropolitan Riveters forward Erika Lawler nearly takes a spill as she hoists the 2018 Isobel Cup with her teammates (Photo Credit: Pat McCarthy). With the announcement on Mar. 31, 2019 that the Canadian Women’s Hockey League (CWHL) will be closing its doors as of May 1, proponents of the women’s game have been understandably crestfallen. The wound is still quite raw, the sensation ranges from earnest pain to blank numbness. Furthermore, the gold medal game of the 2019 IIHF’s Women’s World Championship on Apr. 14 ended in stunning controversy as Finland’s apparent overtime winner against the USA was disallowed under very confusing circumstances. This left many women’s hockey fans to feel disillusioned and disappointed by the IIHF. In no slight to Team USA, many believe (including yours truly) that Finland was robbed of the gold by the game’s poor officiating. We indeed need something to smile about right now! In a notion of solidarity that permeates throughout all of women’s hockey, we asked 20 players to tell THW their funniest or silliest hockey moments. We received responses from players from all over the world. 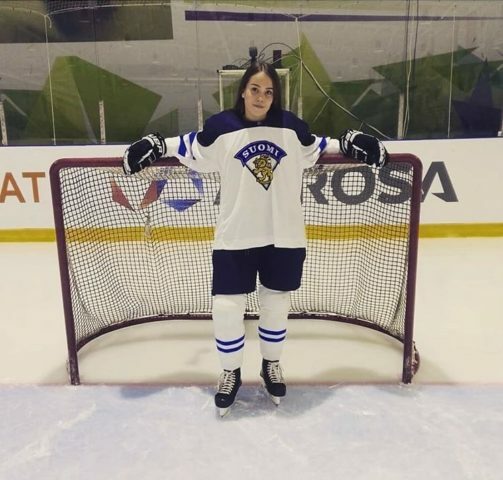 Included were Olympians, along with current and former players of the CWHL, NWHL, Sweden’s SDHL, Finland’s Naisten Liiga, and Russia’s ЖХЛ – each offering to share their stories. Some of their tales are hilarious. Some are zany. Some are maybe downright embarrassing. But we assure you that each player’s personal “light side” moment will get you to grin. Presented to you in alphabetical order, here are 20 humorous instances in the lives of some of your favorite women’s hockey players! 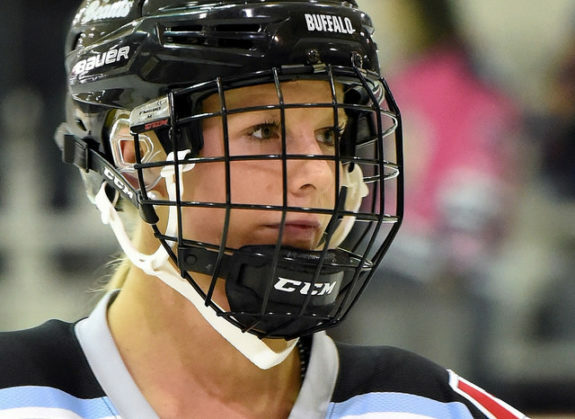 Shelby Bram was a member of the 2015-16 inaugural Buffalo Beauts squad, but had some cold adventures while playing in Sweden (Photo Credit: Troy Parla). I thought about our arrival in Espoo, Finland (at 2019 IIHF Women’s Worlds) with Team France. As it was our first time in the Top Division, we had some expectations about the environment, especially about the locker room. So all the girls were excited about discovering the locker room, and readying with our phones to film this moment. When we arrived at the ice rink, we saw that we will have to dress in an “ALGECO” (commercialized storage container) with two benches and five chairs, two showers for the entire team, and no ceiling. So that was really surprising and funny. 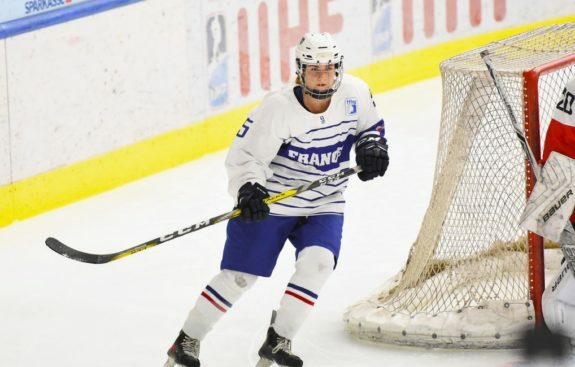 France’s Estelle Duvin took a few tumbles at the 2019 IIHF Women’s World Championships in Espoo, Finland, and had the luck of them being shown multiple times in slow motion on television (Photo Credit: Mats Bekkevold). More personally, when we played against Sweden on Rink 1, before going onto the ice for period three, I forgot (to take off) my skate guard. I fell on the ice, got up, and fell again. The slow motion video showed me doing this on TV two or three times! 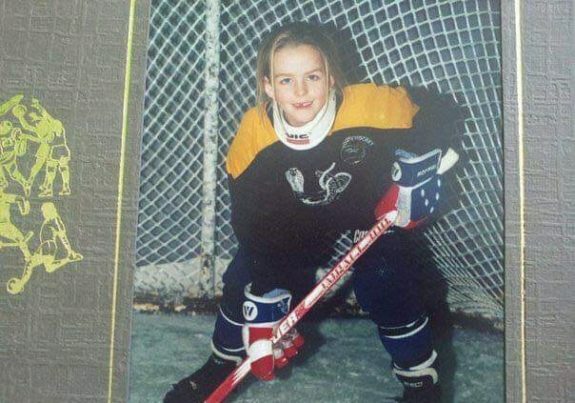 The Connecticut Whale’s Emily Fluke with a hockey grin from when she was just a youngster (Photo provided courtesy of Emily Fluke). “Senior year of high school we were at a tournament in Mississauga, coming off a giant 8-0 win versus Shattuck (Shattuck-St. Mary’s School) – the first time we had ever beaten them. Between periods losing a game we should not have been, our coach is in the locker room absolutely destroying us. Screaming, throwing sticks and garbage cans – going on for so long. He walks out and tries to slam the door as a final statement, but it was a pressurized door and it closed so slow – like a centimeter per 10 seconds – and we all just started crying laughing. It was so funny. “I’ve scored on my own team from behind the goal line of the opposing team. So, it’s round-robin of Nationals 14U. The score is 1-1 against some team from Texas and it’s the second period. I remember this pretty vividly, as you can tell. I’d like to think that my hockey sense is pretty sharp and I can read my teammates well, but this time I did not. 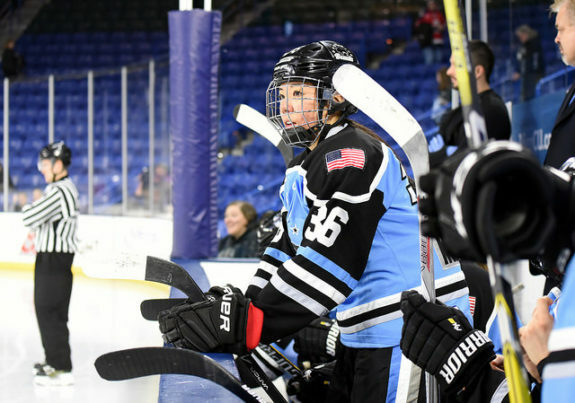 Kourtney Kunichika is an inaugural member of the Buffalo Beauts and helped them to the 2016-17 Isobel Cup championship (Photo Credit: Troy Parla). “I think one of my favorite bloopers was the last weekend of the regular season this year (2018-19). Throughout the last few years I’ve had some funny, clumsy moments like falling off the bench when changing or falling mid-ice when no one was around. So my assistant coach and me had an over-under competition for how many times I would fall off the bench that weekend. 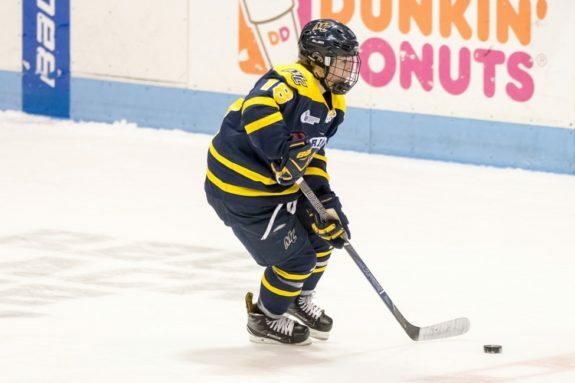 Katelyn Rae was drafted 12th overall in 2018 by the Connecticut Whale (Photo Credit: James Stankiewicz). “Once, quite a number of years ago I was rollerskating with my twin sister Heta. We wanted to improve our skating skills, so we believed we had a good idea. We had a competition with each other – who dares to brake later without crashing out of the street. It was my turn and I had to beat Heta. I thought that now I have to brake as late as possible. 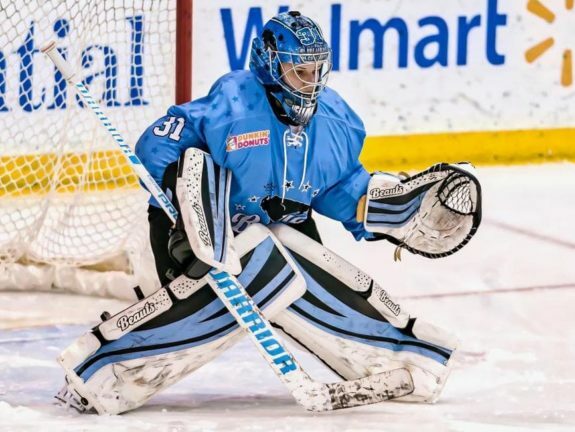 So Jung Shin – Olympian with 2018 Korean Women’s National Team, former Metropolitan Riveters goalie (NWHL). “When I joined St. Francis Xavier University for the first time, I couldn’t speak English at all. When we had our first tournament we took a flight. We went to the airport and some security guard asked me ‘Do you have any firearms in your hockey bag?’. At that time I didn’t understand what he said, but I thought I had to say ‘yes’ because I thought I should say positive things to security guards. And also, I only (understood) one word – ‘hockey bag’. 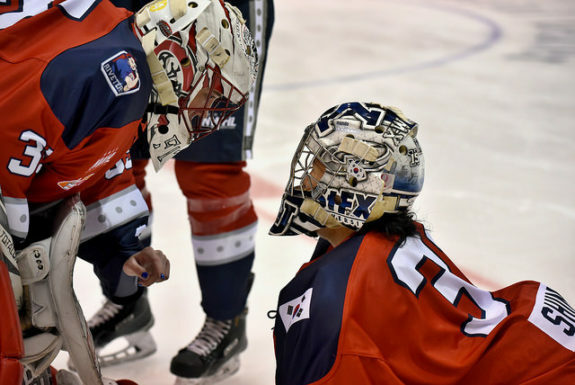 Former Metropolitan Riveters goalie So Jung Shin (right) had a near disastrous hockey-related experience at the airport (Photo Credit: Troy Parla). I thought ‘Oh, the security guard is Canadian. Maybe he is ask me something like “Your hockey bag is cool”‘, or something like this. Okay, so I think this time I have to say ‘yes’. Every teammate looked at me, and everyone freaked out and started yelling at me – ‘You have to say “No”! Say no! Say no!.” The security guy’s face turned red in embarrassment. He also said to me ‘Say no. You must say no’. After that, I realized that something was wrong. From this experience I realized that if I don’t understand what someone says, I should ask.